We spent time on Monday going to see the employers who were kind enough to help with work experience placements for our 3rd Year Skills Students. We have nearly 30 students working in the area within either local restaurants, tourism outlets or tailoring shops. The feedback was generally very good with some employers committing to take students on permanently after school finishes in the summer. We also met some of the previous year’s students who were still with some of these businesses. Great to see this! The picture shows Omar Bah working within a local tailor shop. His employer proudly showed us the high quality pockets on trousers that Omar could turn out. We already knew of his skills since he’d made many of the school uniform trousers in the centre. The crew from the vaccination unit to Stamp out Polio in Africa were back for another set of vaccinations to the nursery children. We had a visit from Dave and Mara Doyle from Southend, who brought loads of resources for us. Thanks to them for their continuing generosity. The picture shows them with Sendeng and Helen, our wonderful Sunrise Office staff. Mr Mbye, our new Education Director, worked with Tony Bound to interview for a new Arts and Crafts teacher. The candidates had to do a theory and practical lesson with the Skills Students as well as a written test and formal interview. A very thorough process for them. We are working to make an offer with employment contracts now. 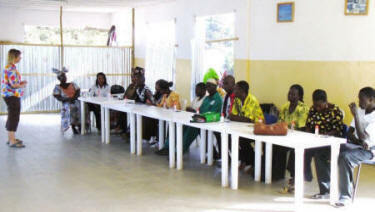 These kind of HR processes are all essential parts of running the office for Helen, even in The Gambia. The big event this week was the Nursery children's trip to the Bijilo Forest Monkey Park. This all began with the teachers explaining about calm behaviour and how to treat the wild life. The teachers came to school on Sunday evening to make the picnic for the children. This took several hours but made sure that they got out first thing on Monday morning. 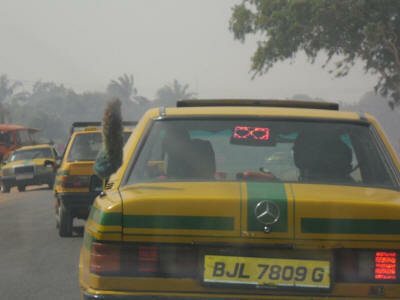 The bus to the park was full, but not overloaded by Gambian standards. All the teachers and helpers went with the children on this bus. There were many monkeys (Green Vervet and Red Colobus) in the park and the children were very respectful, even chanting “Good morning Mr Monkey” on one occasion! 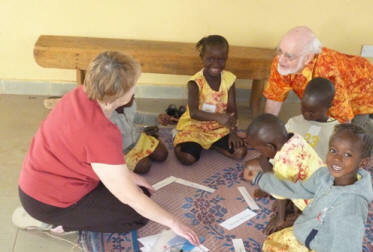 Many of the hundreds of Gambian birds could be seen when the children kept quiet. We all had a lovely picnic on the beach, sheltering under the shade of some tall trees near Kololi Beach Club Hotel and then played in the surf. The children were quite cautious and subdued before lunch but when recharged with Nan Buru, Chicken, Cake and Wonjo juice they went beserk. Throwing themselves into the sea in various clothing they were clearly thrilled with the whole experience. Some had never seen the ocean (Atlantic), let alone played in it before. On the building front, we are now up to the ceiling level of the ground floor, having added concrete lintels to the tops of the windows. One of the pictures shows the builders foreman, Aboulie Darboe at the top of the stairs in the Lower Basic School. As we walk through the gates in the morning we see three sunrises at once - the sun, our sign and our new buildings. Polina is one of the third year students in skills currently on work placement at a local restaurant, 2 Rays, near Senegambia. She says her European cooking skills are improving slowly. have taken 27 third year students on work placement. Interest in knitting is growing - many Gambian students learn to knit at Upper Basic school but it seems that the only stitch used in The Gambia is "knit". So some first year students have learnt to "purl" and are making samples of stocking stitch, moss stitch and rib. The next step is to help them learn to read simple patterns so that they can make small items like pencil cases and bags, to sell at Open Days. Any volunteers? On Thursday it was Cookery practical for first year Skills students - Spaghetti Bolognese! Meanwhile Susan, Kumba and Mary prepared spiced beans and tapalapa for food at break. We had a visit from Jill and Ray Perkins, and Sam, who sponsor Sirra. Sirra and her Aunt came to the Sunrise office from her Lower Basic school nearby, so that they could meet for the first time. Ray and Jill toured Sunrise and had their picture taken with Sirra. On Monday we said "au revoir" to Dawn and Paul, Ian having left last Thursday. In recent weeks, with 4 trustees and 2 advisors on site every day, a great deal has been learned and a great deal of hard thinking and debate has gone on - especially over evening meals. (Somehow long-term planning is difficult during day to day life at Sunrise! ) One of Ian's "smaller" tasks was setting up the new computer donated for the teachers' use. Here he is, trying to explain that it isn't for the Nursery pupils! As Ian, Dawn and Paul return to their "other" lives in the UK, we thank them all and look forward to their return to The Gambia and Sunrise before too long. Our four Lincolnshire friends returned for a final visit; Garth arranging some further sponsorship and Jamie offering to help organise cookery equipment donations from the UK. By now they should be safely at home, with happy memories, we hope. On Thursday Year 2 Skills students cooked ladyfish in their practical lesson - deep-frying chips and battered fish over charcoal stoves. Thursday was special as Mr Nurudeen Mbye, our new Education Director, arrived. He immediately started learning as much as possible about GETS and Sunrise, and had his photo taken for the blog! At break he tested the quality of the cooking and then spoke briefly to the Skills students. We welcome him and wish him a long, happy and fruitful association with GETS at Sunrise. Late last week, I spotted Mrs Cham doing a Maths practical lesson with her class who had to pick up 10 stones and count them out into her hand. Because I was hovering with the camera I had to receive the stones too! Monday afternoon we had the very sad news that Mrs Cham's younger sister had died earlier in the day after a long, debilitating illness. Fatou is naturally distraught and the thoughts of all the staff, students and Trustees are with her and her family. Our first visitors this week were Barry and Barbara Young from Cheshire who currently administer their own Charity in Tanzania. They are now reviewing their involvement in the country and having viewed our website and liked what they saw, they came to see what we are doing at Sunrise. There was also a visit to the aptly named 'Timbooktoo' - the place for school text books - to collect our pre-ordered text books for the Lower Basic School. These Grade 1 English, Maths and Integrated Studies books cover the first year of the Gambia Basic Education Course. Whilst we were there, Paul, the GETS treasurer, purchased for the Charity a real treat - a copy of the Gambian Taxation Act 2004! In fairness, it is the current edition. Mama and Dawn doing singing games with Class 1 under the shade of a tree. 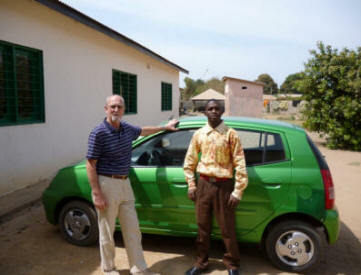 Steve planted a couple of mango trees, with Abdoulie, one of our watchmen, helping. The watchmen are watering our new mango trees every day so we hope they will flourish! Kevin and Sue Storr were staying in the same hotel as Garth Isaac and after hearing his enthusiastic tales of all that is happening here, decided to visit Sunrise. Whilst here they decided to sponsor the education of one of our nursery girls who will be going to our new Lower Basic School in September. Another visitor was Vicky Champion who was interested to see what opportunities there were for volunteers at Sunrise. The builders have been busy too, after a quiet spell. The sound of the 'Compactor' is deafening and the vibration through the ground unnerving! Before anything else I need to correct an important omission from earlier publicity. 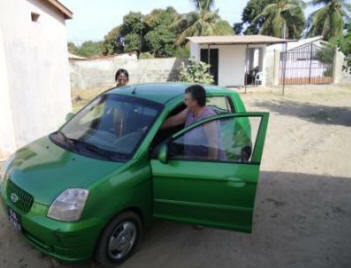 The Charity wishes to thank Jeff and Mandy Evans for their tremendous support of, and interest in, our work in the Gambia. Like many other unsung folks they have made a significant contribution both to our education projects and in supporting needy children. Skills Advisors Tony and Erica have been working tirelessly this week to try and create some order and structure to the vocational elements of the skills curriculums. Tony has been concentrating on cookery, not surprising as he has international experience as a chef! I don't think doing an inventory of pots and pans is what he had in mind though when he agreed to be a Skills Advisor. Their work is laborious and involves a lot of paperwork and pencil-sucking, but it is incredibly important to the viability of the Skills Centre and consequently to our long term vision for Sunrise. The really significant event this week is the decision to appoint Mr Nurudeen Mbye as our new Education Director. Subject to terms and conditions being agreed he will join the Centre at the beginning of April. He is currently Principal of a nearby Skills Centre and is young, ambitious, approachable and enthusiastic. Among our many visitors this week were four guys from Lincolnshire, Garth, Jamie, Richard and Doug, visiting on behalf of their pal Jay Peck, who had made a generous donation to the Charity. At Garth's suggestion we had prepared a greeting to Jay on the nursery blackboard and took a group photo of the guys, the children and the message to take back to show Jay. The message is a heartfelt one from all the staff and students at Sunrise and, of course, from the trustees. Although this was done specifically for Jay it reflects our grateful thanks to all donors - named and anonymous. The centre was open to all comers, young and not so young, with food and drink items on sale from D5 (10p). The Wonjo juice, made from Sorrel apparently, was excellent. The event started at noon - with an obligatory intermission for prayers and an unplanned one because of a power cut and faulty generator - and eating, drinking and dancing continued until the food ran out and the music (very loud!) came to an end. It was great to see a crowd of enthusiastic dancers enjoying their own cultural dances rather than pop music! You will have noticed that Garijam's scarf has not featured in the last 3 blogs - she has discovered an interest in dressmaking! The Lower Basic School is now up above ground and fenced in for Health &Safety reasons. Soon we will have the whole concrete raft completed. I shall watch the progress avidly from afar! Finally, as this is likely to be my last blog before returning home I would like to thank all the folks out here, residents and itinerants, who have made my stay so enjoyable. It has been very busy but made worthwhile by the warmth of the sun - I must have had my 2012 annual vitamin D intake already - but more importantly, by the warmth of the staff, the students and Gambians in general that I have met. On Monday Mr Ali Bah and Ian went in Helen's car to visit some of the third year Skills students who are out on 'placements' - work experience. It was most gratifying to hear that all the students visited were attending every day, were punctual (even the habitual late-comers to school) and appeared keen to make an impression on their respective employer, which they had all done successfully. We were also visited on Monday by Tony and Vicki Longton and their daughter Sophie. Mrs L works in an Exclusion Centre in the UK and Sophie is a Psychologist working with 'troubled' children - both were fascinated to see Sunrise and our achievements. So much so that Sophie came back on Thursday to spend some time with a few of the Nursery children with word games. A major event this week was the 2-day interview process on Tuesday and Wednesday mornings to select a new Education Director. The formal interviews on Wednesday included a flying visit from Lamin Ceesay, chairman of the Bakoteh Community Council Education Committee. The outcome of the interviews was most encouraging although a final decision could not be reached: there were two very good candidates that the panel could not in fairness separate. 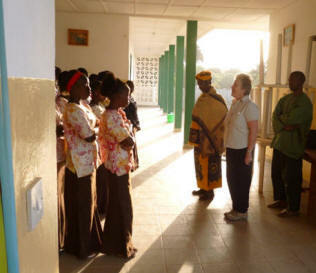 Both have been invited back independently to meet and talk to all the Gambian staff. The panel were all 'toubabs' and it was felt that feedback from staff would highlight any cultural aspects not considered by the panel and, equally important, give the staff an opportunity to be involved. We are pleased to report that some of the outstanding Bantaba work has been (almost) completed. Both the cookery area and the Batik area now have integrated blackboards to enable the teachers to present important facts and data at the workplace rather than in the classroom. 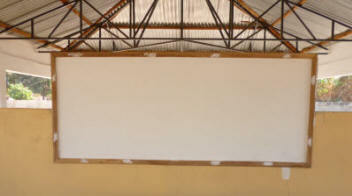 The blackboard is white because the stucco finish, difficult to get hold of in the Gambia and the cause of the delay, has to dry thoroughly before the blackboard paint can be applied! Dawn and Paul Webster, both Trustees, arrived on Tuesday and can be seen getting down to work with the nursery children, after they had tidied the store room and unpacked all the goodies that they brought over - including the remainder of the St Margaret's mountain of wool. There are now four of the six trustees in the country! We shall gloat about the weather to the two shivering ones when we speak on Skype on Sunday. Erica Wren the second half of the Skills Advisor team arrived on Thursday and took the opportunity to address the Friday morning assembly - standing to attention like a Sgt Major! There was a blitz in Tie&Dye on Friday to produce the uniform material for London Corner Nursery school, which is also administered by Helen. Next week our skills students will be busy cutting out and sewing the uniforms, ready for the London Corner pupils to wear at the celebration parade for Independence Day! The building work is progressing well and we shall soon have the floor: walls will then go up rapidly. Tony Bound who is one of the charity’s two Skills advisors, joined us on Monday for 9 weeks. Tony, Helen and I, together with a representative of the Bakoteh Community Committee, will be interviewing 5 candidates for the vacant post of Education Director on Tuesday and Wednesday next week. Tony has been hard at work shortlisting the original 14 applications. A nursery highlight for me was the children having a music lesson i.e. singing and dancing in the open air – uplifting! Skills students have in the past done some rug making using rags, which I remember doing as a child myself. Interest has been re-kindled and here you can see a student preparing the rag segments, which are much more colourful than the ones I recall. More wool arrived this week and is being put to good use. Maria Cham has made crocheted a lovely child’s hat, which I have purchased for my youngest granddaughter! Sadly there’s no update on the scarf this week but watch this space for a double helping next week. Steve and Chris Humphries have been busy around the Centre too. The ‘swimming pool’ paint worked a treat – so Steve gets busy painting GETS on the chairs. Chris occupies her time showing some of the brighter nursery children how to make alphabet soup. Which segues nicely into this week’s cooking exploits. Usually there is a number of local women that come into the school at morning break to sell, among other things, tapalapa (bread) filled with spiced beans to the students. As the lady who sells the tapalapa is currently ‘travelling’ we decided to buy the bread (we don’t have enough ovens to bake it ourselves) and get the Skills cooks to do the honours. It is a great success and their spicy beans are excellent – the sausage (spam) rolls were very, very tasty too! Another dish that appeared was Bean Cake, which is black-eyed beans steamed in a banana leaf parcel until solid and served with fiery-hot palm oil. And finally, the LBS is slowly appearing out of the ground. The foundations are now completed and the builders are backfilling the trenches with the mountains of spoil. Visitors this week - apart from Tony Bound (who is one half of our team of Skills Centre Advisors and therefore part of the family), were Mavis Newmarch and Mike Turpin. Mavis had canvassed many of her friends and brought a broad selection of items from our list. Mike presented the centre with a superb collection of artists coloured pencils. One for each of the 360 colours of the visible spectrum! people whose support is invaluable. This week the sewing class has been trying to design and make the most difficult part of the graduation uniform - the mortarboard! First attempts were very floppy but Boubacarr Diallo our tailoring expert, is showing an almost flat finished article using wire stiffening - the model is Amie Jaffa. The simple obvious solution would be to use stiff card, but that doesn't wash too well! On Wednesday there was a splendid turnout of parents who came in to the centre to see how the first year students were progressing. Most seemed very happy with results - and rightly so; there has been a noticeable improvement in attainment by the students. There has also been a noticeable improvement in parent interest. At a recent PTA meeting very few parents appeared on the night, although after pressure from the students more came the next day. On Wednesday at least 90% of parents/guardians attended. As a slight diversion from success, one Steve of our volunteer helpers (seen scoffing Mbahal Bonga last week) has been trying to paint 'GETS' on the back of all our plastic chairs. He has tried three or four different types of black paint with no success, the best result is a grey smudge. But, thanks to Colin, a local supplier we have acquired some swimming pool paint that should do the trick. I wonder if we will get students putting towels over the back of them to reserve them? a teacher but is actually part of a nursery numbers lesson, counting the number of paces along a stretch of the wall. As you can see, the building work is moving apace. The first wheelbarrow of concrete was poured on Monday and by Wednesday after a lot of 'Messi' work, the foundations were completed. 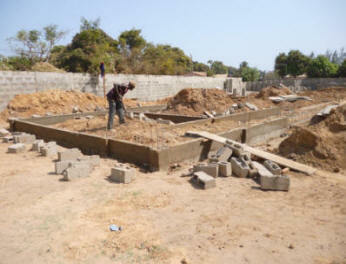 By prayer time on Friday, a fair amount of block work had been completed. Finally, Garijam has been hard at the knitting as you can see. This was a week for visitors, friends both old and new. On Tuesday the Sunrise Centre welcomed Tim and Rachael Spilsbury who were visiting us for the first time bringing with them a suitcase full of resources. They particularly enjoyed a visit to a nursery class. Tim seemed to enjoy being a photographer too! Even when the centre is particularly busy it is always a pleasure showing new friends our work and explaining our plans. Helen and Ian were also pleased to welcome Mr Ousman Touray Chairman of the local ARPC (the ruling political party) who dropped in to discuss our building project, plans and progress. As you can see he was given VIP treatment. Thanks to the villagers of St Margaret's At Cliffe in Kent and their friends who donated a large amount of wool, knitting needles and crochet hooks. The skills students are now into knitting and crocheting in a big way. High summer in the tropics and Garijam is knitting a green scarf! A big cooking day on Thursday with the skills students making Tomato Jam, which consists of the flesh of 2.5 kilos of tomatoes, a large handful of root ginger and 2.5 kilos of sugar all boiled on a hot charcoal stove until the right consistency is attained. It sounds simple and tastes terrific! The Gambians are a frugal nation so the skills students decided not to waste the bits of tomato left over from the jam so they chose to make Mbhal Bonga, a dish similar to pilaff using the Bonga fish. Chris and Steve Humphries, regular volunteers from the midlands, thoroughly enjoyed the honour of sampling the dish, as did the chefs! Work on the LBS continues, more bricks have been made and the ground prepared for the mixing of concrete for the foundations, which starts next Monday. In excess of 20 cubic metres of concrete will all be mixed and poured by hand! One of our generous donations before Christmas was cash to buy 32 Adult Numeracy textbooks to help teach basic Maths skills to the students. We decided to start to use them from the beginning of the new term. So after Paul Webster spent some time using our new Sunrise school stamp (to clearly mark ownership! ), we launched the books onto the unsuspecting students. In the background one of our regular volunteers, Daniel English (who is helping us for a year), is working with our teacher, Ali Bah to try out the new books. Instead of rain, The Gambia suffers from dust storms, straight off the Sahara. Dust is quite a problem in terms of keeping everything clean, especially any white clothes. The picture here shows how visibility reduces and one sensible taxi driver using his duster (an essential tool) as an aerial for his car radio! 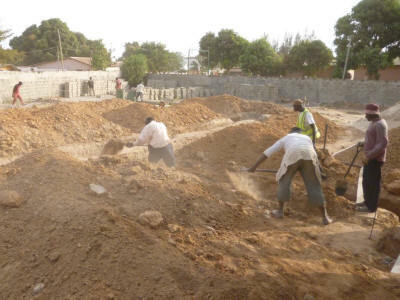 The other big news in the Sunrise Centre is that the Lower Basic School building work continues, as it will up until June-ish, when we all worry about the rains coming. The idea that you can forecast the weather by the month will never cease to surprise me! The builders are working to refine the foundations ready for the important concreting processes, all man handled by local people of course. In the background there are yet more bricks under production. When you don’t come on a lorry, this task is much, much bigger. Bill and Oliver Teasell visited Sunrise this week, bringing more welcome resources for the centre. At the start of any new term we also have many students and parents visiting the Sunrise office to collect cheques for school fees. All this activity makes life a little more hectic than usual. This week you see Helen and Mrs Mendy on their way to find local businesses that would take 3rd year students for a work experience placement. This takes place up to the Easter Holidays each year. Students are invited to consider the type of business where they would like to work. Some are going to the tourist area to work in hotels and restaurants and others to tailoring workshops. Elsewhere in Sunrise Skills Training section some of the students have been working with a mass of black cloth to turn out graduation cloaks. It is traditional to wear these for the graduation ceremony, usually hired from a tailor as we did last year, but much more satisfying and cost effective in the long run to make your own. The building work is now well under way. Foundations have been dug out ready to take the footings of the new buildings. The soil in this area consists of a mixture of sand and clay. 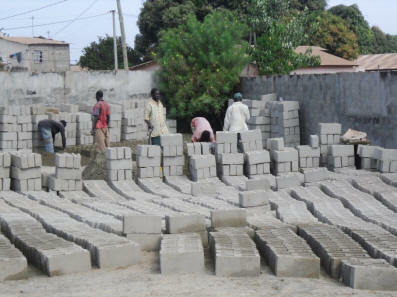 One of the other key tasks at this stage is to make up the blocks that are used to build the school. 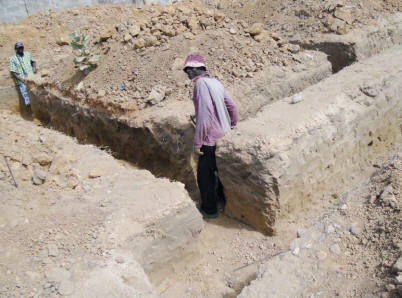 Unlike in the UK, it is quite normal to make blocks on the building site in The Gambia using a mould, turning each one out to dry in the hot sun. In parallel with the building work we have many other things to do. One of them is first aid training. 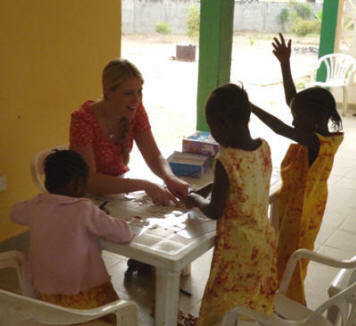 GETS is also responsible for Training at the Dumbarton sponsored London Corner School so asked their teachers and other staff to join with all the Sunrise staff in attending a one day course, given by Fiona Nelson from First Aid 4 Gambia. 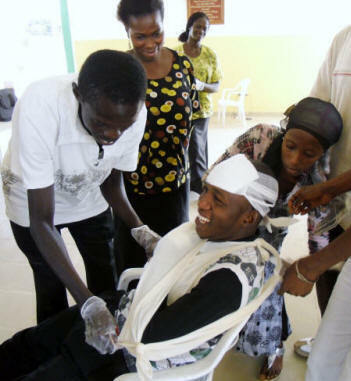 This organisation organise many courses, on a charitable basis, to raise the local level of first aid skills - http://www.firstaid4gambia.org/. 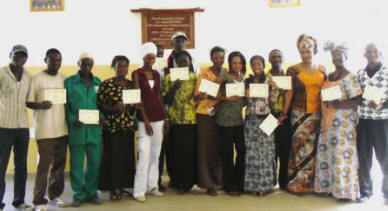 Certificates were received by all attendees. Later in the year we have other training planned for staff, to help broaden skills and improve education standards within Sunrise. This is on top of the Jolly Phonics training and Teacher Training courses recently attended by the Nursery Teachers.